I mainly work on topics in galaxy evolution, using the heavy elements as tracer particles of the flows of gas into, within, and out of galaxies. I am particularly interested in the interplay between galaxies and the intergalactic and circumgalactic media, with a focus on how star formation and stellar deaths affect galaxies and their surroundings. I use different theoretical models (hydrodynamic simulations in addition to empirical, semi-empirical, analytic, and semi-analytic approaches) to both extract from the data as much information as possible and to get at the underlying physical processes giving rise to the observations. 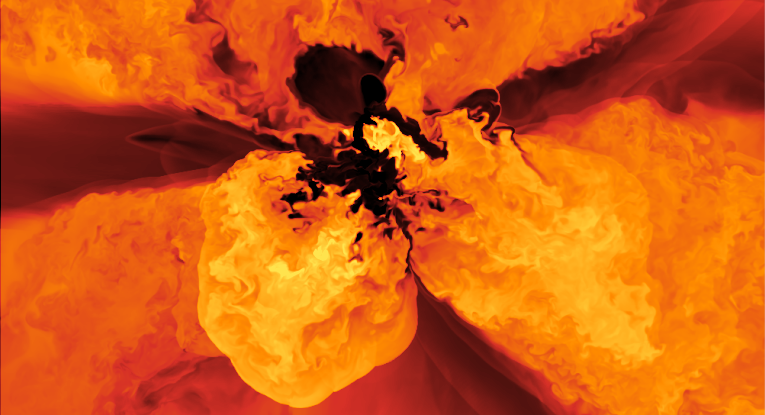 The above image from my group's new FOGGIE (Figuring Out Gas & Galaxies In Enzo) simulations shows the gas temperature around a galaxy accreting cold gas from the cosmic web and spewing hot, freshly enriched material into its environs. I am especially interested in using synthetic data generated from astrophysical simulations such as these to compare to and make predictions for current and future observations of galaxies and their gaseous halos. I am actively involved in several ongoing observational projects, most of which relate in some way to the diffuse gas around galaxies. I am part of the Keck Observatory Database of Ionized Absorption toward Quasars (KODIAQ) project, an ongoing program compiling and combining spectra of high-redshift quasars from the Keck Observatory Archive for the study of intervening circumgalactic and intergalactic absorption; this large database of exquisite high-resolution and high signal-to-noise spectra is particularly exciting for understanding the kinematic structure of the diffuse universe. Closer to home, I am involved in Project AMIGA (Absorption Maps In the Gas of Andromeda), a Hubble+GBT program aimed at mapping the halo of the nearby Andromeda galaxy, one of the few galaxies which we can currently probe along multiple lines of sight. I am also a member of the COS-Halos, COS-Dwarfs, and CASBaH teams. You can also search for me on astro-ph or on ADS, and my full c.v. is here.